Usage of grocery shopping apps tends to skew young, but there's also plenty of interest from the 55-and-up crowd: 49% of this group has used a grocery app or would consider it, according to a survey of more than 1,000 consumers. Among all age groups, 43% are current users, and another 32% are open to the idea. As in so many other areas, Amazon is a leader here as well: 65% of respondents have used the Amazon grocery app, beating out the 60% who use apps from their local grocery store. 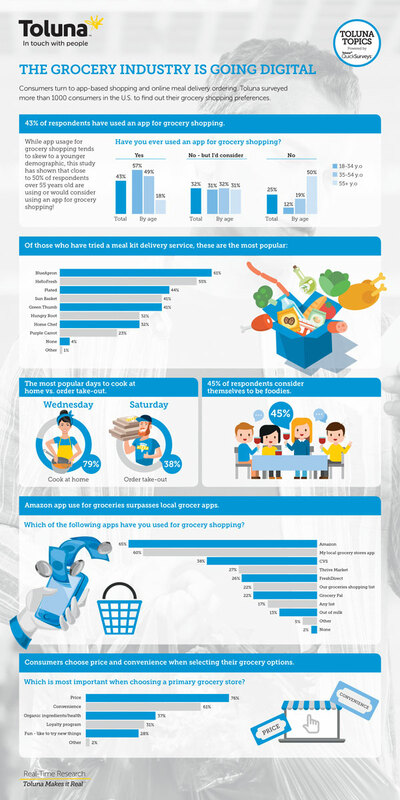 Discover more about grocery's march to digital in this infographic from Toluna.